at Blacklands Malt in Leander, Texas (Oskar Blues Brewery). Oskar Blues Brewery in Austin, Texas, has announced a change to the company's flagship beer, Dale's Pale Ale. 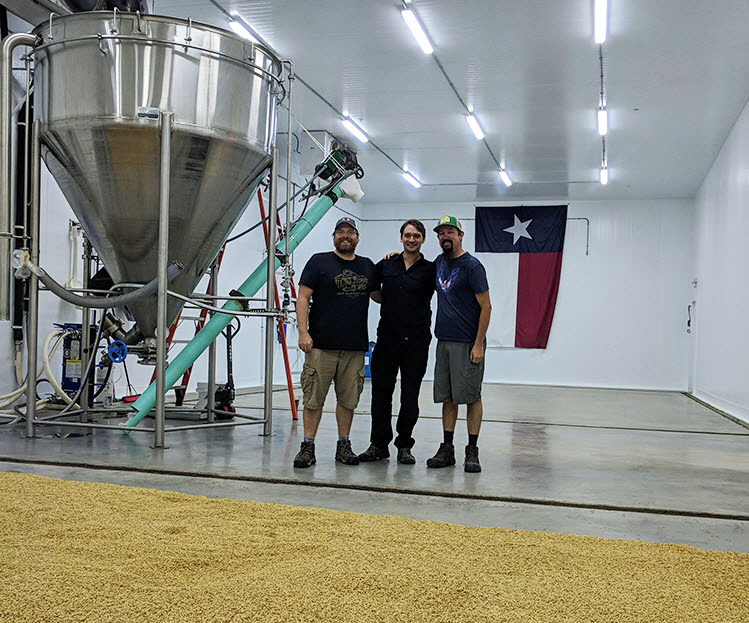 The beer is now being brewed with locally-crafted malt developed by Leander-based Blacklands Malt. Up until now, Dale's had been brewed with commercial Munich malt, but a move to Blacklands allows the brewery to incorporate sustainable, locally-sourced ingredients, while supporting the community and calling attention to the art of craft malting. As for how the change came about, the idea started germinating when Tim Mathews, Oskar Blues' head of brewing operations, met Blacklands' founder, Brandon Ade, in 2016. 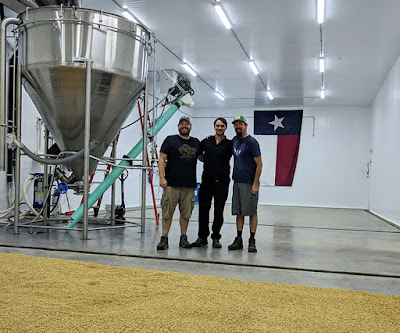 After that, Ade and Michael Harris, Oskar Blues’ head brewer in Austin and malt enthusiast, started working together by incorporating Blacklands malt into specialty beers. Then, in the fall of 2017, they started talking about a larger project. What followed were months of research, development and collaboration between the two teams, including the Oskar Blues’ lab headed by Brian Roye. Eventually the kiln schedule and recipe were dialed in to develop Brown Field 10 Texas Munich, which meets the color and toasty flavor profile required to brew Dale’s Pale Ale. Harris has an equally compelling reason for pursuing craft malt – it’s part of supporting the community. Ade also makes the point that it’s important to raise awareness around the connection between the consumer and the supply chain, and to call attention to the farmers that grow the barley that ends up in beer. Blacklands has worked with Texas A&M University since 2012 on research that aims to empower farmers to grow barley. "It’s about supporting farm families outside of hops - hops get a lot of limelight," says Ade. "Malting is equally important." According to a press release, Dale’s Pale Ale brewed with Blackland's Brown Field 10 Texas Munich is now available in Texas and surrounding states.